The best investors spend time analyzing financial statements. Tim Bennett sums up which parts are worth spending time on. 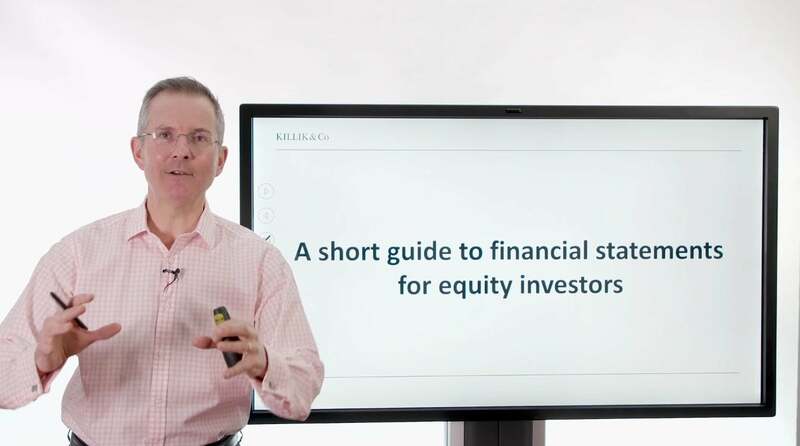 Welcome to this Killik Explains finance video this week. A short stretch short to a big topic financial statements for equity investors. Basically we are all eyes on this Monday February heading through quite a big season potentially for corporate annual reports appearing. So what’s in them. And if you are frankly intimidated by the sheer size of them what bets can you take out as being the most useful in a reasonable space of time. Well the backgrounds of this that is every year companies by law will have to produce annual financial statements. Boy are these big documents a hundred pages or more. Quite possible for a fully tested Footsie 100 company for example. They’re often don’t up to 30 of us disembark all the study of us tomorrow. Now they don’t have to be bought. Those are two quite common days. The company at the end of the calendar year basically an end to the tax year are quite popular. So the question is given how big they are only analysts tend to go through them with a really fine tooth comb so a cover to cover if you like which mates could you pick out to help you reach a reasonably false judgment on where the company’s heading and how he’s doing. So what do you get. Well I’ve divided into three sections you’ve got a massive document with a huge index page will see one in Tesco. You get corporate reports. Now you get narrative other words yes story as told by the directors in Panas so carefully because they want you to read what they want you to read the narrative. Then you get hit with numbers of three primary statements. Probably 40 to 50 pages in. So in a moment I’ll suggest which bits of that 40 to 50 pages you might want to read first and then a lot of sporting nights sporting what these three primaries statements and the supporting notes can go over another 40 or 50 pages. Now in theory you should read the old but if you haven’t got time where you got the technical ability where do you start. Now covert polls. Watch out for the next slide it looks pretty unpleasant. So this is Tesco and you get to see the writing on it is so much jammed into one page. But the point I’m trying to make is you know out of all this lot. What would you pick out. I mean would you read it all anonymous. Yes there are a few bits here that are more interesting than others. If you could read them there’s an interesting bit that there’s an interesting bit that if you like and there’s another bit just down here. Now for anyone thing Yarkoni and see what you just circle what are the three bits that I would start with. Personal preference my opinion why would I stop. Well I would say the financial review not a bad place to start usually prepare by the finance director it’s basically narrative but it’s normally reasonably focused combat some of the other bits and it does tell you a fair amount about the way the business has been performing and why it has got to financial terms by the year and then principal risks and uncertainties. OK a little bit boilerplate is a little bit one size fits all. But as an investor really important to handle the principal risks facing the business might be. And when he get the support he notes I’ll show you a place to hunt down some evidence that this is giving you the full picture because that’s part of the name of the game with accounts. Does the story match the numbers and then the director’s remuneration report any to sell out too much. Let’s take a look at what the directors are paying themselves if you like. I mean it was up to approve it one of the directors think they’re worth. Does that stack up with how you think the business is performing. So lots of other things you could read and bombing’s you’ve got time do so. Well those are good places to start. My view. Now Section 2 the financial statements to keep this brief and I’ll give you a reference at the end some day and find a lot more information but these all half way through all the profit and loss account the balance sheet and the cash flow statement. Now some analysts and investors have a preference they say cash is king. Number three matters more than the two I disagree. I think they will play their part in telling you how the business has performed the wires got to the profit and loss account is financial performance over the last 12 months in revenue and cost terms. The balance sheets like a snapshot of whether business has got to what it’s worth using accounting rules. At the end of the year that first December 31st of March the cash flow statement tells the story a bit like this one over here but using different techniques using cash in cash out all put another way if you’ve got to balance sheets. The past 12 months of Paul there’s this is the latest one as last year’s the profit and loss account and the cash flow statement These are like snapshots if you like at a particular point in time what’s the business worth in asset terms. These are the stories that tell you how the business got there and they tell a slightly different story. And it’s worth comparing and contrasting that to now get straight in with the reference to those people thinking growth the needs of all if you want to understand a bit more about profit accounts balance sheet and cash flows are put together please do go to Kilic dot com for Slash learn.